I think we would have been willing to pay 11mil a year for a goalie tandem like this. We got it for way cheap and by accident. Both those boys are reaponsible for a lot of these points we collected since dec 31 st.
11 million, or a legit chance at your name on the Cup forever...? Easy choice, for these guys at least. You can see the players are all playing for one another and enjoy being around their team-mates. You can't fake genuine emotions. The whole team was exuberant with Mrazek for keeping this team in it, especially during OT. Reminded me of how this team came together back in the day. Every season, there is that one team that surprises everyone, makes the playoffs and has a good run. Could we be that team this year? It would be hard to quantify anything in the turnaround without also harping on the JW influence and role. His "aw shucks" persona is immeasurable in helping an atmosphere of looseness and casual professionalism take root, letting young players see that its OK to have fun while focusing on details and responsibilities. Though some skill has diminished, he has a smartness and people ability that by definition leads in the most professional way. It reminds me of what I thought R. Whitney was when he moved out west to finish up his years. Absolutely. Not diminishing JW. His shot the other night against the Blues was electric. My point is it goes beyond the obvious "C". There is veteran depth of character guys who don't have a letter. Ah, the Cinderalla teams. We keep playing like this we will be a cinderalla team. You never know we could win the cup this year. I know fans are probably thinking we're not a cup winning team but a few years back in college basketball I believe it was William and Mary that made it all the way to the final before they lost. To be the best you have to beat the best. During this run we have beaten great teams. I don't care what fans think we have a good shot to beat Boston on Tuesday. We've already played them well this year and would be 2-0 against them this season if Darling did not have a goalie meltdown the last 30 minutes of the game and give up 3 goals because he was stellar the first 30. That was the first game. We won the 2nd game 5-3. I know that was at home and we'll be in there barn on Tuesday but doesn't the 12-3-1 record on the road last 16 games mean anything along with a 9-1-1 record last 11 on the road. It proves we're tough to beat on the road. If teams haven't taken notice of us they have too now. 'Take Warning' as the Cane's commercial says. I admit, before December 31st I thought this team wasn't going anywhere this year; they were so out of it (in like 12th or 13th). What a change I've seen since. Keep it going. The closest thing we’ve had to a cinderalla winning it all in basketball in the last 20 years was Butler making it to the final game twice. We’ve had some make it to the final four as well (VCU, George Mason, & Loyola). then we can back to State for a cinderalla winning it all. They are the Hurricanes regardless of what they wear. I've got to go with the 1985 Villanova team (8 seed) over Georgetown as an even bigger Cinderella than the 1983 NC State team (6 seed) over Houston. Both were huge underdogs, but State did win the ACC tourney that year whereas Villanova lost to St Johns in the 2nd round of the Big East tourney by 15 pts. I KNEW they didn't have a prayer against Georgetown in the championship game, lol. No question about it. One of the best nights of my life. That and the Phillies winning the World Series in 1980. You Gotta Believe! I was there last night and what an overtime. I was seven rows from the ice and couldn’t believe what I saw. Mrazek definitely earned his paycheck. Those saves were outstanding, especially the last one. As soon as I saw Nino & Seb take off, I knew something was going to happen. Canes were well represented also. I sat next to a young couple originally from Wilmington. Lots of Canes sweaters roaming the concourse. Thank you boys for the great win!!! Outside of Syracuse winning it all in 2003 that's my favorite final of all time as well. I absolutely hated Georgetown at the time, lol. Have you got a beard? They zeroed in on one Cane fan early in the game; wonder if it was you. 1. most of us veterans on the board have been waiting for this for a decade! Has this been worth all the self loathing we’ve all been going through since 2009? No, but damn, this tastes sweet ! 2. Don, if you and Rod aren’t at least discussing the possibility of riding the Sneaky Pete/Big Mac train past this season, you’re idiots! 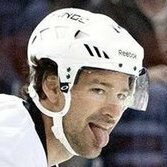 We rode Cam like a rented mule after Manny Legace left in 2010 and never gave him a solid backup. Now we have an insanely talented tandem...a tandem that has the boys in front of em playing with a confidence we have been longing for for so damned long, I’ve forgotten what it looks like! 3. If you don’t give Seabass whatever he wants for a contract after this season (obviously not McJesus numbers), I’ll bust out my torch and pitchfork again! 4. No trades for the sake of making a trade with this group in the offseason. If Ferland walks, however, I fully expect the team to go actively after a big gun during the UFA period, but not Panarin. 5. Big Rig said this afternoon at the Alumni Game that this was by far the biggest crowd he’s seen for this game...probably cause of all the fan favorites lacing em up. Stuff like this is what helps build SUSTAINED fan bases that stick around through the lean years in secondary markets. 6. Rod had better be in the bleeping discussion for the Jack Adams...we all know that Trotz will win it, but it should not be a runaway like last year with Galant (and that was well-deserved). 7. It’s nice to finally have FOUR SOLID LINES. Even world beaters like Boston have a huge drop off after their second line. We don’t have the firepower of their top line, but we have depth...and that depth will hopefully pay huge dividends if we make the playoffs. 8. I’m not solidly on the “we’ll make the playoffs” bandwagon til we’re in. I’ve been fooled too often...and we just aren’t getting any help from the scoreboard around the league. But damn this team is fun to watch! 9. I’m worried we’ll trade the wrong D-man...and I don’t know who it is...but we have a glut and someone’s gonna go. I worry about it affecting chemistry. 10. Are we having fun yet? 2. Don, if you and Rod aren’t at least discussing the possibility of riding the Sneaky Pete/Big Mac train past this season, you’re idiots! We rode Cam like a rented mule after Manny Legace left in 2010 and never gave him a solid backup. N﻿ow we have an insanely talented tandem...a tandem that has the boys in front of em playing with a confidence we have been longing for for so damned long, I’ve forgotten what it looks like! I agree, I also like how they're rotating the goalies each game. We really don't have a solid starting goaltender (the one's that play 50-60 games a year) and that's fine because that means we basically have TWO and our team plays with confidence in front of each of them. IF we make the playoffs this year; I'm not saying it's a given until we're a LOCK we should do the same thing. Rotate the goalies and if one is hot ride the hot goalie. Great list, but we differ on #6. Rod should not only be in it, but don't know how he cannot win, except that here we go, Old School? I mean, what team is being dragged from the basement, has a new owner, has a new GM, and the HC is a neophyte? And how about the turnover in players? No, if this trend keeps it up, and we make the playoffs AT ANY LEVEL, Rod IMHO should be a serious consideration for Jack Adams. I wholeheartedly agree...but the fact he’s not even a blip on the media’s radar screen for it right now tells me he has no prayer. And I’m still bleeping urinated he’s not in the HOF yet! Trotz will likely get it because of the Tavares factor. After Isles lost him with no return many picked them to bring up the rear in the Division, if not the Conference. Think of the Canes if we lost Aho for the season. In contrast, many thought that because of our D the Canes would do well if the goaltending came through. Now, if Canes keep surging, and especially if we pass the Isles, I suspect a lot of people will sit up and take notice. I'm guessing that many still aren't accepting that this team is for real. Finish it out and they'll have no choice. Trotz will likely get it because of the Tavares factor. Isles lost him with no return, and most picked them to bring up the rear in the Division, if not the Conference. Think of the Canes if we lost Aho for the season. In contrast, many thought that because of our D the Canes would do well if the goaltending came through. The mainstream hockey media pay very little attention to anything about Carolina. For one thing, it’s Canada heavy even though they only have 7 teams. Cooper probably won’t get much consideration because Tampa was expected to do well, but they are on their way to 120 points which is insane (and which everyone will forget if they don’t win the Cup). Then there’s our old friend, Bill Peters, who does coach a Canadian team that has far outstripped expectations. I still agree Trotz will probably win it because everyone started the season thinking the sky had fallen on the Islanders. We didn’t have a Tavares to lose, but Rod should not be penalized for that. I think the Canes have exceeded expectations every bit as much as the Islanders. If we pass the Isles, maybe they will have to give it to Rod. But we haven’t been on one national telecast yet (and the one scheduled for last season was scratched). Just doesn’t seem like the Canes register much with most of the hockey establishment. Did Lavi win it in 2006? Just curious, AWACSooner - what's wrong with Panarin? He wants a either a big market team or a team with good financial incentives (read: Florida with no state income tax). Also, have heard numerous rumors from both Chicago and BJ fans that he can be a head case prima donna at times.